Americans are getting fatter every day. I’m sure there’s a statistic out there pointing to how every x number of minutes, a person somewhere out in America is determined to be obese. Despite the fact that the City and County of Los Angeles are vast, there is a serious lack of parks to ensure that people have spaces to create community, stay active, and most importantly, stay healthy. Obviously, the problem of obesity in the United States, and especially in communities of color, will not be resolved by simply creating more spaces for recreation, as access to fresh, affordable food is also a key factor, but it would sure help if people in Los Angeles, and other urban cities throughout the country had places to run, walk and play. In the meantime, as there is less and less available land in Los Angeles for parks, people that are able to get have easy access to open space (and can stay healthier) are those with large yards (keep in mind that about 60% of City of LA residents are renters), can afford a gym membership of some sort, or are fortunate enough to live near open space (there’s very few of us). As a kid growing up in South Los Angeles, it was much easier for me to get to Popeye’s and McDonald’s than to Rancho Cienega Park, which was about 4 long blocks from my house, but I had to walk across the train tracks (where the Exposition Line will soon run) and walk Exposition Blvd, where you found a wide assortment of furniture and trash dumped before you got to the park. Keep in mind, the 1990s were a tough time in South LA (i.e. 92′ Civil Unrest and and subsequent years of blight). I played sports on and off during my childhood since my parents were not always able to afford uniforms. Most of my friends were also in the same situation—they were expected to get home right after school to do homework and/or help out around the house. Participating in sports was seen as a luxury, and when I asked my father if I could participate in more extracurricular activities because my waist was gradually expanding, he said, “that’s for girls who don’t have anything better to do.” I know it had more to do with money than with my father supporting a family legacy of Type II Diabetes. None of my friends played in sports clubs, and the rest of my siblings were in the same boat I was. Exercise really was a luxury. Studies focusing on the obesity epidemic in Los Angeles point to the fact that poor children of color make up a significant percentage of those affected by the disease. And there is an obvious correlation between poverty, food access and lack of open space. A 2007 Los Angeles County Department of Public Health Study found that rates of childhood obesity across cities in the county ranged from 37% in Maywood (highest) to 4% in Manhattan Beach (lowest). The Trust for Public Land estimates that only 30% of LA Residents live within a square-mile of a park. Compared to other high density cities across the country, such as New York or Washington, D.C, where park land makes up 19.4% and 19.5% of all city land, respectively, Los Angeles falls short as parks make up only 7.9% of all city land. This reflection was sparked a few months ago when I moved to the Thai Town neighborhood in Hollywood, within walking distance of Griffith Park, the largest green space in the City. 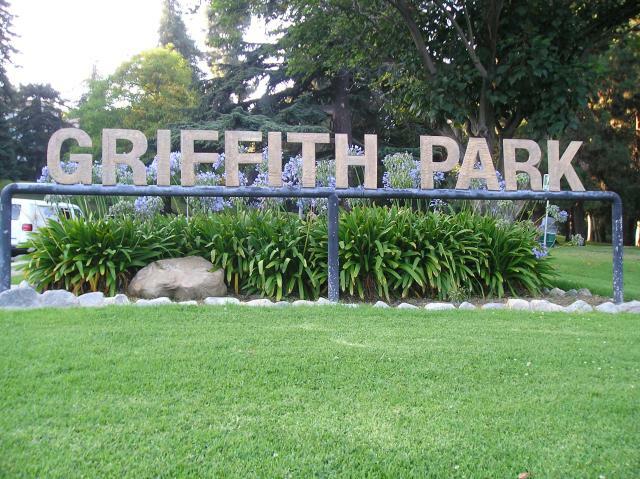 Griffith Park is generally accessible to tourists and all Angelenos, but really, it’s rich people that get to have Griffith Park as their second backyard. (there’s a bizarre story behind why Colonel Griffith J. Griffith decided to donate over 3000 acres of land to the city, partially explained here) There is a high premium one has to pay to live in a more walkable, livable community. In addition to having this amazing “backyard,” I am able to afford a gym membership to the local Y, work at an organization that provides Yoga classes once a week—all the resources at my disposal to stay healthy (in addition to living within a mile of about 3-4 grocery stores). Needless to say, this new-found privilege has brought a lot of guilt for a person who grew up poor, ate unhealthy food, and didn’t feel safe walking to the local park. For the rest of LA County residents that are park poor, what choices are there to stay active? ………..Posted November 15th 2005 …….Los Angeles Daily Journal.Anne Marie Ruff.Daily Journal Staff Writer.LOS ANGELES A 20-year legal battle over 14 acres at the corner of Alameda and 41st streets in South Los Angeles points up how legal strategies have evolved as part of the Urban Park Movement for securing open space in a city that is park-poor..Meanwhile the latest chapter in the fight for open space is being written a few miles away in East Los Angeles..Here 100 acres of undeveloped rolling hills owned by the Department of Water and Power recently has been designated as Ascot Hills park. In 1996 Garcia was part of a coalition that included the Busriders Union the NAACP Legal Defense and Education Fund and Environmental Defense that had just won a federal consent decree against the Metropolitan Transit Authority..
Is that really true? We don’t have such situation here in all cities of former USSR, here the most healthy are the poor people who have many free time at evenings. We surely have the standard horizontal bar and parallel bars in every house’s yard. And you can see a lot of young people there in evening, may be with beer and cigarettes but still exercising. And from USSR times we always have one-two parks or stadiums on every district. They are may be dirty, devastated, but people do go there for a jog. I mean – you really don’t have this sport equipment in the yards?